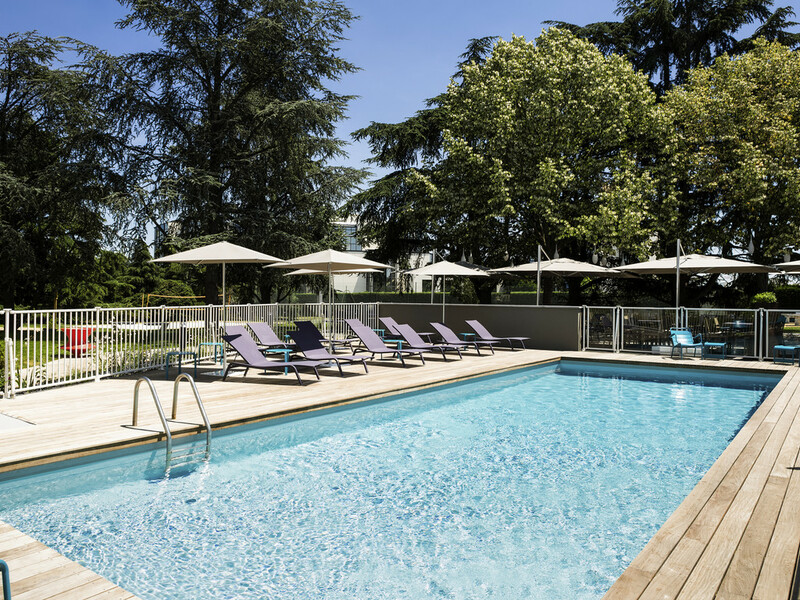 For a memorable stay in Toulouse, stop at the Novotel Toulouse Purpan Aéroport hotel. All of the hotel's teams look forward to welcoming you to the "Pink City" and will help you enjoy a perfect stay. The 4-star Hotel Novotel Toulouse Purpan Aéroport is situated midway between Toulouse airport & the Place du Capitole. It has 123 rooms, a restaurant, a bar, 7 meeting rooms, a free enclosed outdoor car park & a shuttle service connecting the hotel & airp ort. Swimming pool, tennis courts, fitness center... something for all ages. This hotel is easily accessible on the A62 & the A64, and is located 15 mins from the stadium in Toulouse, France's rugby capital, & close to the Airbus site & Zenith arena. The Novotel Toulouse Purpan Aéroport hotel is located between Toulouse city center and Toulouse Blagnac International Airport. Take advantage of the free shuttle bus and a range of sports facilities: volleyball, boules, tennis and table tennis! Enjoy an astronomical experience in Toulouse at the Cité de l'Espace, Aeroscopia museum or Airbus center. Soak up the atmosphere at a Stade Toulousain match at the stadium, or enjoy a concert at the Zénith using the tram, just a 5-min walk from the hotel. Shuttle and free car park. Spacious, contemporary and fully modular, the Novotel room is a true living space which can be adapted to suit all requirements. Recharge your batteries, whether your stay is for business or with family. The rooms have a large bed and a sofa bed, private bathroom with shower or bathtub, separate toilet, minibar, and tea and coffee making facilities to kick-start your morning or to help you unwind in the evening. Our N Café restaurant offers the finest in traditional French cuisine. In summer, our Chef heads outdoors to grill his "a la plancha" dishes right before your very eyes! Live entertainment and theme nights all year round. General hotel was satisfactory, as expected. Room key required reprogramming several time. Morning shuttle buses were always oversubscribed with no record of who is on which bus. shuttle bus on demand, through calling directly did not appear as requested resulting in taxi to complete journey. Good sized room and bathroom. Comfortable bed. Handy for tram and airport. Secure parking. The gentleman and lady that check me in and out had really great attitude. We generally use this hotel when we are flying out of Toulouse airport. It is close to the airport and runs an excellent shuttle bus service. The rooms are comfortable and the facilities are good. Juliette, who was on Reception was excellent; very efficient and helpful. Staff was very nice and professional. On the other hand, the comfort of the room was not the one I expected from a brand such as Novotel (old building, TV remote control was not there, some damages in my room such as scratches on the door). For the restaurant, the quality breakfast and the dinner was good but the timing a little bit long for the dinner. Again the staff was very focused on customer satisfaction (smiling, booking of my taxi,etc). A Pleasant night's stay with the Added bonus of car parking whilst away visiting the family and the provision of a Shuttle to and from the airport. The restaurant and bar do not always hit the same high standard unfortunately. However we will remain customers as the location and facilities are ideal. As expected the hotel was pleasant, rooms clean and comfortable and food in the restaurant was good. Very pleasant staff at reception, bar, and restaurant. Room was good as always. we have stayed every year for the past 10 years so it must be good! Nice hotel, convenient for airport. Nice large room. Restaurant good for dinner and breakfast. Great stay. Comfortable hotel 10 minutes drive from the airport, very nice staff at the reception and restaurant. Food at the restaurant is relatively simple but very well executed. Breakfast buffet is huge. Very good service from your staff, clean room, good food and wine - what more could you want for a one night stop over. We were there overnight and it worked very well. Room, restaurant and wine were very good, and we used the shuttle to the airport and back, which was very efficient. It’s a top class Novotel.